Does your Mitsubishi Colt slip out of gears when driving or fail to even select any gears? Or does it sometimes get stuck in neutral? If so, this may be due to a failed Clutch or Gear Actuator. The Mitsubishi Colt is equipped with an automated manual gearbox which allows it to interchange between manual or automatic at a flick of a button, which is unlike any normal 5 or 6-speed automatics. It operates on sensors and ECU’s which means it does not require a clutch pedal. The three main components that consist within this type of gearbox include the clutch actuator assembly, a gear shift actuator assembly and a gearbox ECU. Position sensors are placed within each actuator, which allows for signals to be sent back to the gearbox ECU to determine the position of the clutch as well as what gear the vehicle is in. The gearbox ECU then also uses this information as well as the vehicle’s speed and other parameters to calculate the required gear, when the next gear change should take place and when to engage / dis-engage the clutch. Unfortunately, as many Mitsubishi Colt owners are most likely aware of – this design has been diagnosed with faults that have caused the vehicle to sometimes be left completely immobile! The list above is just some of the common issues that have been diagnosed within our workshop on a daily basis. Being such a common fault, it is likely you have either a clutch or gear actuator fault and in some cases, it is possible that both actuators have failed together. If you have contacted main dealers already, you will be aware that the price to replace the whole unit can cost in the region of £700 + VAT, which will increase as each actuator will need re-coding to the vehicle. Furthermore, if you opt to replace your unit it will only come with 12 months warranty, and as it is known to be such a common failing part, there is no guarantee that it will not fail again. My Mitsubishi Colt Actuator is Faulty – How can SINSPEED Help Me? We specialise in testing and repairing gear + clutch actuators for the Mitsubishi Colt as well as many other vehicles makes and models where electronic actuators control the vehicle’s gearbox. We can fully bench test and repair your Mitsubishi Colt Gear + Clutch actuator using genuine OEM parts are used when repairing the actuators, to ensure that every repaired clutch / gear actuator meets and exceeds OE specifications. Actuators that are repaired by Sinspeed will not require re-coding when fitting back to your vehicle and for a complete peace of mind – will also come with Lifetime Warranty! 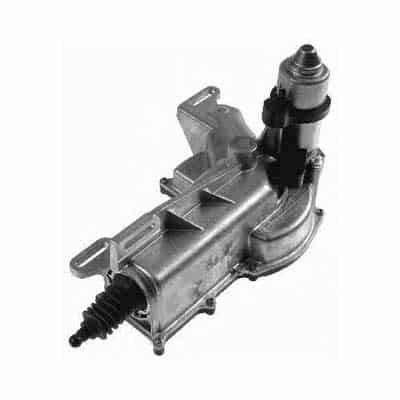 If you have a Mitsubishi Colt with a clutch or gear actuator fault then give us a call today on 0844 847 9999 or alternatively send us a quick message here. It does sound like a common actuator fault. We’ve got the facilities to fully bench test and repair them, so if either the clutch or gear actuators are failing, we should be able to see the fault and then we will proceed with remanufacturing the unit. All repaired units are returned with a lifetime warranty and do not require reprogramming when installing back to the vehicle. We have seen this type of fault before and have successfully repaired it. The fault is more noticeable in cold weather conditions and can become progressively worse. I have sent you an email with full information and pricing, if you have any questions, please reply to the email and we’ll be happy to assist you. Hello. I have a Mitsubishi Colt cz2 1.3 petrol 2009. Sometimes it does not want to move and when Cihanging Gears it shakes the car badly. When this happen i Change the Gears manually. If ı can manage to do it without accelerating there is no problem. What do you think is the problem.? How much would İt cost to repair? The symptoms you have described do relate to a possible clutch actuator failure but we cannot be certain until the unit has been thoroughly tested. We test all units before remanufacturing so if the unit is not faulty, it would be returned with a simple test fee & return carriage. 2008 Colt diesel car keeps lurching forward when first starts but is okay after driving for a bit getting error code P0702. The P0702 fault can be triggered for many reasons – unfortunately, it does not point to a specific component on the vehicle’s transmission control system. The clutch actuator is a very common failing part and can cause the problems that you are experiencing. However, you should have the fault thoroughly diagnosed to find the root cause of the problem. If you find the problem is due to either the clutch actuator, gear actuator or the transmission control module then we should be able to help you. We offer testing & repair services for all three of those parts. I have a Mitsubishi Colt 4 door CZ2 automatic 2009 I have a problem with the clutch engaging and disengaging at low revs, is there a software update from misubishi to cured this problem or can it be adjusted with existing software? You would need to contact your local dealership to confirm whether they offer a software update for the transmission system. If the problem persists, we’ll be happy to take a look at the clutch actuator for you on an isolated test rig to see if we can replicate the fault. If the unit is faulty, we can remanufacture it and return it with a lifetime warranty for complete peace of mind.